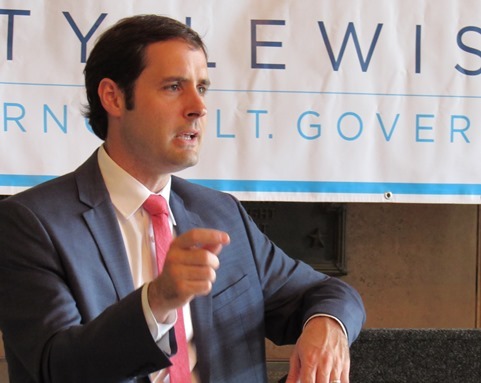 Governor candidate Josh Svaty chooses running mate – Welcome to Wyandotte Daily! 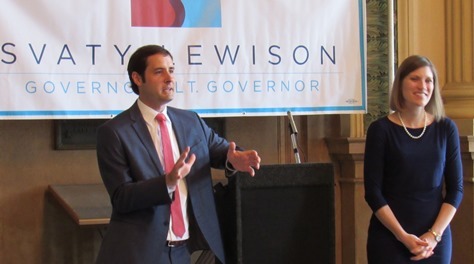 Josh Svaty, a Democratic candidate for governor, swung by Memorial Hall in Kansas City, Kansas, on an 11-stop blitz Wednesday to introduce his running mate, Katrina Lewison. Svaty, a farmer, a former state representative, EPA senior adviser and former Kansas secretary of agriculture from Ellsworth, Kansas, emphasized his running mate’s qualifications. Lewison is a West Point graduate from Hutchinson and Buhler, Kansas, who served as a Black Hawk platoon leader during Iraqi Freedom, and who is now a director of consulting and training in Manhattan, Kansas. She and her husband have three children, and she is a member of the Manhattan-Ogden school board. Svaty said they are both concerned about education and the future of Kansas. Svaty, who is married and has four children, outlined some of his issues during the speech Wednesday. In his speech, Svaty said that the next governor has to work on Medicaid expansion, lower the sales tax on food, and take action to retain teachers in the state. He said he supports restoring funding to the schools. He received applause when he said the government has to rededicate itself to children, including needy and disabled children. In answer to a question from audience member Nancy Burns, Wyandotte County register of deeds, about the most important challenges, Svaty said challenges include the length of time it will take the state to pay off its bonded indebtedness. He also talked about revenue streams, mentioning recent news stories about the possibility of future online sports gaming. He said Kansas should have a tax on any online sales in Kansas. Unified Government Commissioner Mike Kane asked him about his position on the prevailing wage. The state has blocked the UG’s former prevailing wage ordinance. 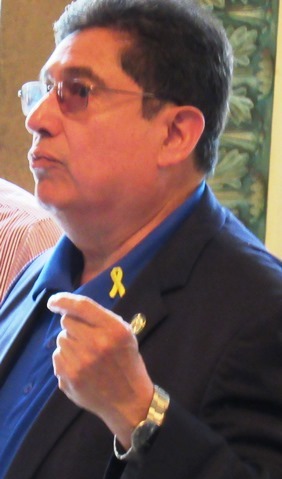 In answer to a question from State Rep. Louis Ruiz, D-31st Dist., Svaty said he was in favor of the state supporting a path forward for children of immigrants. On the question of his budget priorities, and what he would change from the previous administration’s budget, Svaty said he supports reinvesting in higher education again, and said the state also needs a 10-year transportation plan. Gov. Jeff Colyer signed a bill creating a transportation task force on Wednesday. The budget bill he signed Tuesday still makes transfers from the Kansas Department of Transportation funds to the general fund, but the amount of the transfer has been reduced. The budget bill that Colyer signed Tuesday restored some funding to higher education and schools, while Colyer vetoed a KanCare provision that would not provide funding if the governor required work requirements. More details on Svaty’s positions on the issues are at www.joshuasvaty.com/. State Rep. Tom Burroughs, D-33rd Dist., who introduced Svaty on Wednesday, said, “The people of Kansas recognize we need change.” He said Svaty helped Wyandotte County pass casino legislation in past years in the Legislature. 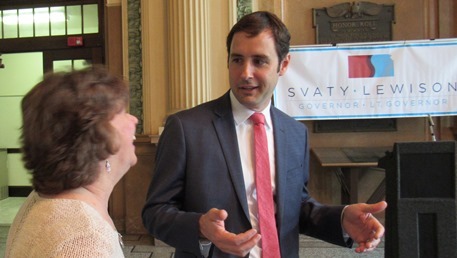 Svaty has been campaigning for governor for a year, but the campaign seems to be just starting to pick up some interest among residents, who will vote Aug. 7 in the primary. In the past week, Republican Gov. Colyer, who is running for election, has made at least four appearances in Wyandotte County. Democratic candidates for governor have made appearances at the Wyandotte County Democratic breakfast last month and some are scheduled to speak there this Saturday. Other Democratic candidates for governor running in the Aug. 7 primary include Carl Brewer, Wichita mayor; Laura Kelly, the Kansas Senate minority whip; Michael Tabman, retired FBI special agent in charge and news commentator; and Dr. Arden Andersen. The filing deadline is noon June 1. Back in January, Svaty reported the highest campaign contributions among Democrats running for governor, at about $192,000, compared to Sen. Kelly’s $155,000 and Brewer’s $45,000, according to campaign finance records. A Docking Institute poll in April showed that Kelly had the highest positive support of the persons who knew her, of all the gubernatorial candidates. Republican Kris Kobach had the highest name recognition among all candidates, but his ranking was second lowest on positive support. Svaty had a high positive rating, but lower name recognition than Kelly and Brewer. Kelly has the support of some prominent Kansans, including former Gov. Kathleen Sebelius, former Mayor Carol Marinovich and former state party chairwoman Joan Wagnon. Leading Republican candidates include Gov. Colyer, Secretary of State Kris Kobach, and Insurance Commissioner Ken Selzer. Then there is independent candidate Greg Orman, who will not appear on the ballot until November, and who has raised more than $400,000, according to campaign finance reports. More than 30 people turned out to meet Svaty and his new running mate on Wednesday. Some were supporters, some were there to meet the candidate before making a decision in August. 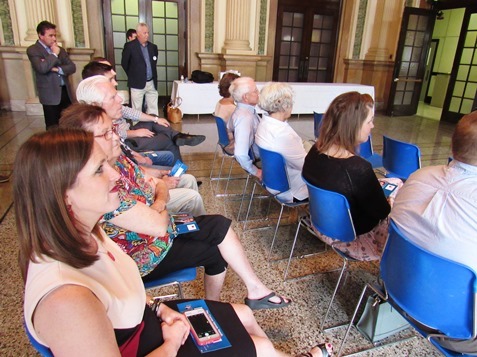 State representatives from Wyandotte County were in attendance, including Rep. Burroughs, Rep. Ruiz, Rep. Stan Frownfelter, and Rep. Pam Curtis, as well as former Rep. Bill Reardon. Rep. Curtis, D-32nd Dist., said she was glad to see candidates showing an interest in Wyandotte County, and would like to see other candidates hold campaign events here, also. 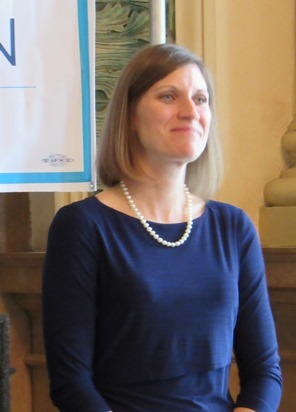 Svaty and other candidates plan to speak at the Wyandotte County Third District Democratic breakfast at 9 a.m. Saturday, May 19, at Las Islas Marias restaurant, 7516 State Ave., Kansas City, Kansas. The breakfast, open to Democrats, begins at 8:15 a.m., with the program starting at 9 a.m.